I have a 2017 Africa Twin. The idea and design of the AltRider fender riser makes sense if you're going to have your AT off road. However, installation of the rear extension brackets may need to be modified to fit. 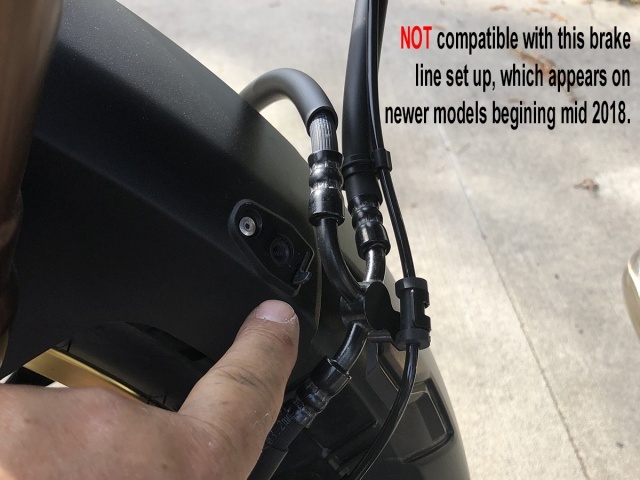 Perhaps the 2017 factory fender bracket is machined differently than the original 2016 model that AltRider engineers designed it for, but the tapered screws that fit into the countersunk mounting holes does not tighten down and the AltRider bracket is loose , which would not secure the back part of the fender in place. Either the threads of the screws stop short or the countersink is too deep. Here is the GOOD NEWS. I called AltRider Customer Service and spoke with Bruce. After listening in detail to what I had experienced with my 2017 AT and discussing with others on his team, he thought that perhaps there was an error in manufacturing on that particular lot, as they had not heard from any other customer with the same problem. So Bruce promptly shipped out a complete replacement kit and it arrived the next day. I removed the first set of brackets and screws and installed the ones from the replacement kit. SAME PROBLEM. I went to the hardware store and purchased a couple of M6 spring washers and placed one between the tapered screw and the countersunk mounting hole. That spring washer took up just enough space to bring the threads in enough to tighten all the way down to the factory fender bracket, and with the included thread lock that AltRider provides with each kit, that bracket is not going to move! I called Bruce back at AltRider and explained that the replacement kit had the same problem, and how I fixed the problem. He was going to check with the engineers to see if there is a difference in the 2016 and 2017 and adjust accordingly. GREAT CUSTOMER SERVICE!! I highly recommend purchasing the AltRider fender riser kit if you're going to take your Africa Twin off road. Just be prepared to spend 30 cents extra for a couple of M6 spring washers and save yourself some hassle trying to make it fit.